Choose a breed that works best as an attack dog. Some breeds such as German shepherds and rottweilers are easier to train than other breeds. Step2 Train the dog in submission commands such as "sit," "stay" and "heel." This teaches the dog to obey the sound of your voice. Later, this helps to train the dog to attack when given the command. It cannot learn to move until you give the command. Step3 Teach the dog to be indifferent to strangers and other dogs. Step4 Start with on-leash training but advance to off-leash. Choose a single word for "attack" and one for "stop". Be consistent. Give slack to the leash when giving the attack command, and pull it when giving the stop command. Work toward having the dog obey the commands without the leash controlling it. Step5 Develop the dog's bite. Start with a stick, and move into a bite suit. 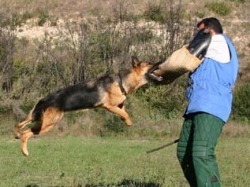 Train the dog to bite on the arms and legs of an attacker to best immobilize the person. Step6 Simulate attacks with the help of another person in a bite suit. Issue commands, and reward the dog when it responds accordingly. Once it has mastered them, train it to respond without issuing the commands, based on it only seeing you under attack. The dog must be taught to attack on its own initiative if, for example, the owner is unconscious and cannot issue a command. so he sits still. If the dog makes any small attempt to attack, command him again to "Sit" and hold him back with the leash next to your left leg. Make sure to continually praise the dog and encourage him by saying "Good boy", "Good" to help him sit still. The other person will then need to walk around at a certain distance (so as to not provoke the other dog) and then leave quietly. Make sure to then congratulate your dog and then continue on with your walk. Repeat this training for several days in a role. Little by little the other person helping you should get closer with his or her dog until you are finally able to get the dogs to be together peacefully. Make sure though to keep in mind that when the dogs are together to be very careful, always measuring the distance and time a possible aggression could occur. It is possible that your aggressive dog will tolerate the proximity of another dog at a few meters of distance, however if the other stays in that position for too long while staring at the him, it is possible he will not be able to contain himself and attack.